As the first quarter begins to play out in 2010, real estate in New York City is beginning to show a shift. As we slowly come out of what some consider the most challenging market in almost 15 years, we are now seeing that the high end luxury market is beginning to come to life again both downtown and uptown. Sales in this current quarter are up 8.4% from the same time last year and up an incredible 10.9% from the previous quarter. I define super high end as apartments selling for more than $10 million, and while the era of bold-name, tabloid stories of $50 million sales are mostly over, this top market is still very much alive. From October 1 through February 1, there were 32 sales recorded of more than $10 million in Manhattan. As you can expect, the bulk were in condominiums with twenty-four condominium sales and eight co-op sales. The most expensive was a co-op at $40 million. In fact, the seller of that co-op at 820 Fifth Avenue, Lilly Safra, only moved downstairs. She sold her 12th floor apartment and bought the second most expensive co-op for $33 million on the fourth floor in the same building, not too bad of a tradeoff for $13 million. 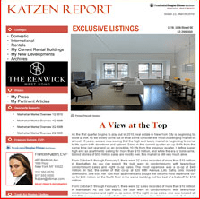 From October 1 through February 1, there were 32 sales recorded of more than $10 million in Manhattan. As you can expect, the bulk were in condominiums with twenty-four condominium sales and eight co-op sales. Of the eight co-op sales, one was located at 820 Fifth Avenue and sold for $40 million. In fact, the seller of that co-op, Lilly Safra, only moved downstairs. She sold her 12th floor apartment and bought the second most expensive co-op for $33 million on the fourth floor in the same building. Not too bad of a tradeoff for $13 million. A breakdown shows some interesting results: Of the eight co-ops listed, five were on Fifth Avenue in the 70s and 80s, and one each on lower Fifth, Central Park South and Park Avenue. The most expensive co-op/condop sold was a penthouse at The Mark on East 77th Street. This sold for $60 million. The most expensive condominium was a penthouse at 15 Central Park West that sold for $38,600,000. Apart from 820 Fifth, the prices on the avenue ranged from $10.4 million at 1133 Fifth Avenue to $13,900,000 at The Pierre. Although many of the previously mentioned high sales are located uptown, the downtown luxury market is also showing inherent soundness. The Superior Ink Building, located at 400 West 12th Street, had eight closings over $10 million, the first for one building downtown. As mentioned in last month’s report, the owner of a fast-food chain recently purchased the penthouse at 40 Fifth Avenue for $11 million, again demonstrating that the downtown area is hanging tight in the luxury sales market. As we make our way through the first quarter of 2010, we are seeing some trends in the luxury market. We can confirm that this niche market is definitely not dead and that buyers are looking both downtown and uptown. Interestingly, re-sale seems to be a hot ticket especially for international buyers looking for “use” properties rather than investments at this time. Foreign buyers are coming to New York looking for that perfect, super luxury apartment and ready to spend top dollar. Nevertheless, mortgages are becoming extremely hard to come by and not having mostly cash readily available to put down has had a major affect on how deals are being transacted. That being said, buyers in this high-end market are often fortunate to have liquid assets available, making their purchases more easily completed. This new market is very different in what it now requires to make a real estate deal come to together. The bank has become the leading component to the transactions of today. This luxury lifestyle in New York City is going to require more skill for the buyer to get what he/she needs from the bank, but more importantly, this also offers some great possibilities for a buyer in New York City, unseen in a very long time.